“Medical tourism” can be defined as the process of traveling to different countries (outside the residence) for receiving medical care. Originally, the term referred to the travel of patients from less-developed countries to developed nations in pursuit of the treatments not available in their homeland. India is growing as a popular Medical tourism destination as it has tens of thousands of skilled physicians and nurse practitioners. 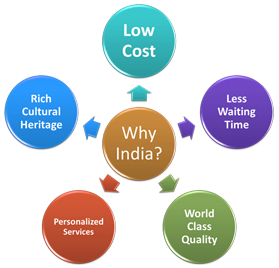 Over the last two decades, the economic boom in India has led to the building of medical facilities and infrastructure that rival the very best that western medical care that the west has to offer. Growth in the popularity of medical tourism has captured the attention of policy-makers, researchers and the media resulting in the increasing number of facilities for medical tourism seekers. Bringing together the biggest event for the leading names in the medical tourism and healthcare industry is the International India Medical Tourism Congress (IIMTC) –”A journey for Health.” IIMTC is a two-day confluence that would be held on 13 and 14 December, 2014 at Kempinski Hotel, Delhi. The two-day confluence would have a series of workshops conducted by the most renowned international speakers, covering topics from medical tourism, wellness and spa, current medical research initiatives, latest innovations in health sector, future business opportunities, insurance, healthcare quality to globalization in healthcare. The event would be ideal for all the organizations, institutions and individuals associated with medical tourism in some way or the other. However, to be more specific, the event is ideal for Accreditation bodies, Consultancy firms,Country TRADE Commissioners,Government Bodies, authorities, ministries, embassies and consulates,Health and medical spa experts,Healthcare management companies,etc. Healthcare travel facilitators,Hospitals and clinics,HOTELS and airlines,Insurance companies and insurance service providers,MARKETING and branding companies,Medical tourism agencies,Tourism authorities,Travel agents,etc. Various Hospitals, Insurance companies, Leading Medical Tourism associations and Industry leaders from over 20 countries across the World.So, make sure you are part of it to meet, network and interact with the industry peers and learn from the pioneers. IIMTC is a grand initiative to invite professionals from local, regional and international Healthcare Sectors, Wellness and Spa centers, medical facilitators as well as tour operators and travel agencies for the confluence focusing on networking among the stakeholders, high quality of medical services, and INVESTMENT opportunities in healthcare throughout the world. So, hurry and register now for IIMTC, which would take place on 13 and 14 December, 2014 at Kempinski Hotel, Delhi.